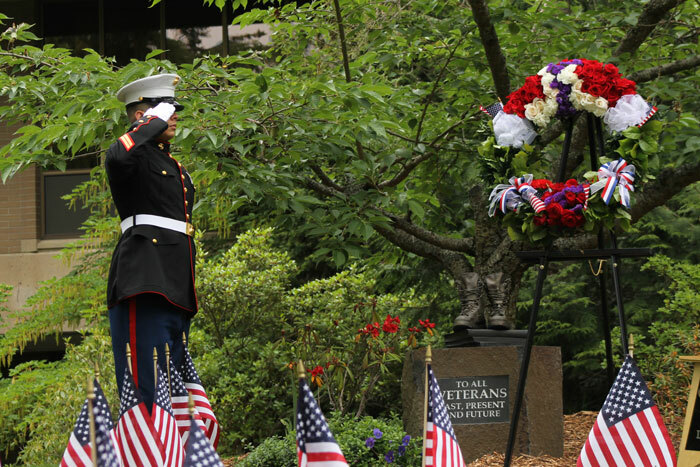 2014 Edmonds Community College Memorial Day Ceremony. Photo courtesy of Edmonds Community College. Edmonds Community College will host its fifth annual Memorial Day Ceremony at 10:30 am on Wednesday, May 23, 2018, in the college’s Black Box Theatre. “We want to honor the fallen in our community,”said Fernando Moratalla, retired U.S. Marine and Edmonds Community College security officer. He is also a member of the ceremony planning committee. Edmonds Community College Associate Vice President of Human Resources Dennis Curran will be the keynote speaker. He is a 24-year veteran of the U.S. Air Force. Artwork, including paintings and sculptures, by local veterans. Members of the VFW will re-create a Battlefield Cross as a symbol of remembrance for those who have given the ultimate sacrifice. The Black Box Theatre is in Mukilteo Hall on the Edmonds Community College campus at 20000 68th Avenue W, Lynnwood, WA. Edmonds CC is home to the Veterans Resource Center, which serves the needs of over 225 veterans and their family members attending Edmonds CC by providing Veterans Affairs counseling and certification, an on-site academic advisor, career counseling, and an inviting place to meet other veterans.